E2k produced the wedding engagement party for at Shalimar (the name given to the home of Romesh Wadhwani) on Saturday, July 2nd. Building on the cultural heritage of the bride and groom, the event created a fusion of Indian and Spanish culture. The spectacular menu, created by Romesh with Amber India chef, Vital Shetty, featured twenty five different fusion delicacies. The signature drink, called the Shalimar Salud, provided the perfect summer combination of champagne, mango rum, ginger liquor, cognac with mango puree and Valencia orange juice. Catering production, service staff and table design were provided by Meme Pederson and the team at Taste Catering. All of the waiters were dressed in Indian or Spanish costumes. 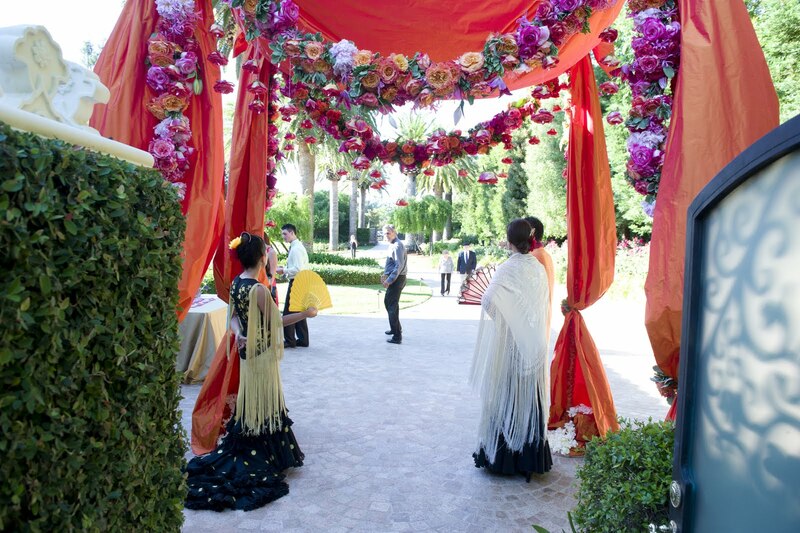 As guests entered the party through the “Secret Garden,” they were greeted by models in Spanish and Indian attire, flamenco guitarists playing on top of a flowing fountain, and a table/tambura duo playing for a Spanish senorita. Gypsy Dancers then directed them to the reception around the pool. For the reception entertainment, e2k created two production numbers with fusion choreography by Erin Olmstead. These numbers were interspersed with Paso Doble and a Flamenco duets. Music for the opening portion of the event was provided by the Santa Barbara-based quartet, Luna Gitana. 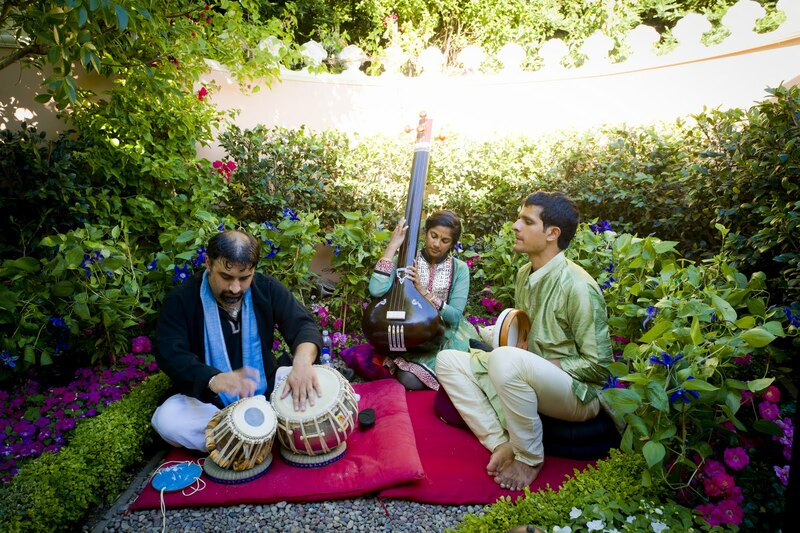 The cultural juxtaposition shifted at dinner with Indian music provided by the the Sangati Center from San Francisco. As the desserts went down, the energy increased with two hours of non-stop dance music by Los Angeles-based, Impuse. The fourteen-member group presented a concert-like tour of genres spanning six decades. The dance floor, made of plexiglass covering over the pool, was jammed with party-goers in a colorful assortment of formal Indian and Spanish attire. The e2k project manager was Laura DeGood with production support provided by David Gill, Trisha Ricci, Mike Brady and Michael Olmstead. 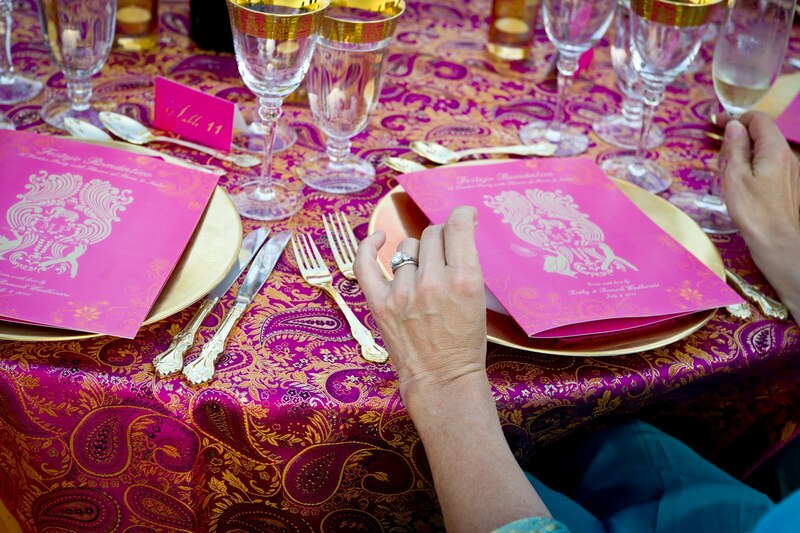 The beautiful event program was created by e2k Art Director, Meghan Harris. 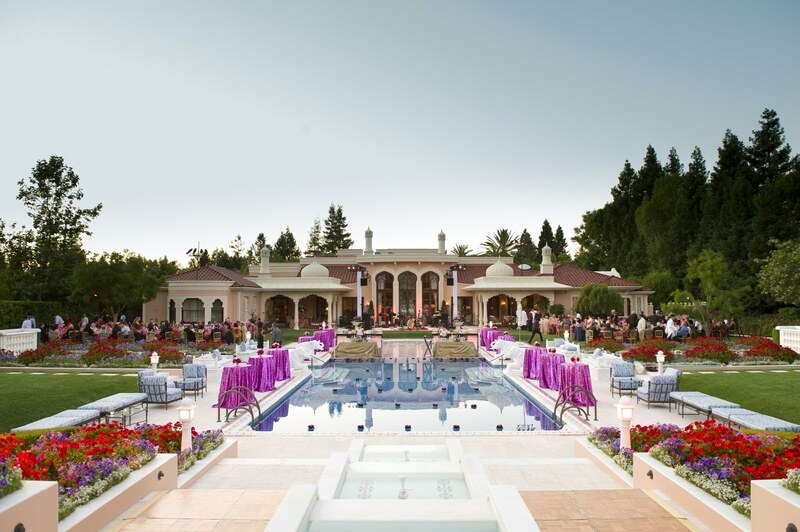 The magical event lighting was designed by Mickey Fimbres from Impact Lighting, and sound for two stages at opposite ends of the pool was provided by Sound on Stage. So beautiful! This event was the buzz of the town so thank you for giving us a glimpse inside. I LOVE the floral entry, what an amazing way to greet your guests. This piece has inspired me and I am going to contact the floral designer for my wedding Chuppah. You didn’t mention the florists name so I did some research – Alabasta the Flower Shop in Los Altos. Thank you again for the inspiration!